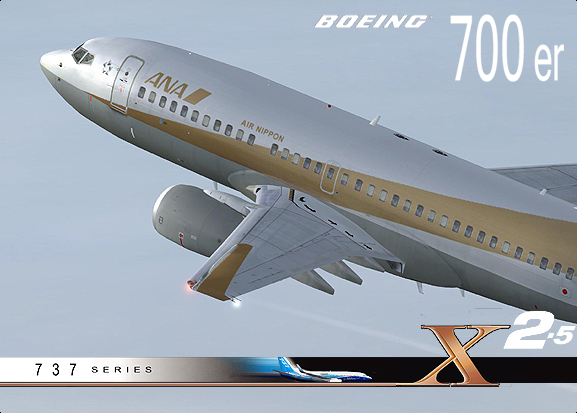 The NEW and Advanced Boeing 737-700 ER X2.5[e] - Download Special Edition. 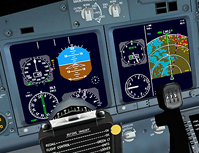 * OPS FMC Technical Upgrade Pack (VNAV Path Descent & further Logic Processing). *** All packs above will be included as part of a new limited, Special Edition Offer. 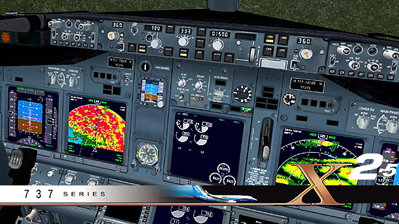 The NEW and NATIVE FSX Version of the new and very unique, Boeing 737-700ER represents a comprehensive, state-of-the-art package from its new EGPWS Terrain Radar to its very advanced, VNAV Path Descent Logic aming many otehr FMC enhancements. For pilots seeking to more than meet their growing simulation requirements and to advance their skills in extended range familiarisation and to practice and complete mission-intensive and challenging, evaluation-led solutions. 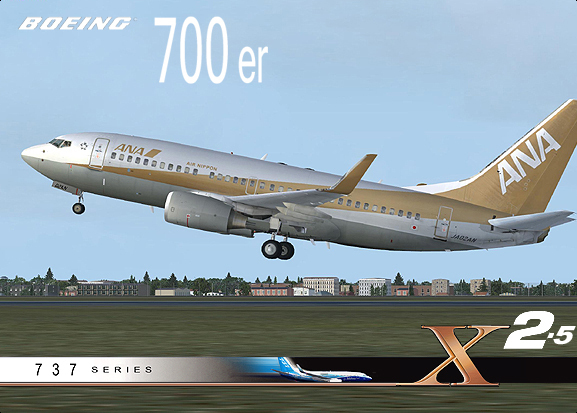 The new X2.5 version of the Boeing 737-700ER offers an even more accurate base as well as a competent practice platform for professional pilots looking to study extended range flight like no other (other than its sister; 900ER, the 700ER is the only extended-range Boeing 737 of its kind in the world now flying in FSX)! * Boeing 737-700ER X2 Aicraft in Green Zinc (awaiting customer) Delivery Scheme and Boeing BCA Livery Roll Out Scheme. * Boeing 737-ER Flight Deck and Sound featuring over 1200 different sounds and fx. * Advanced FMC and FMCS Logic. * RAMP Ground Pack - comes complete with engine covers, wheel chocks and gear pins (and a range of further effects such as a WindFORCE Fx Engine that activates static engine blades, windmilling them in high winds, (depending on wind strength and direction)! * EGPWS Terrain Radar - Full Command EGPWS Visual and Sound Pack. * Technical Upgrade adds further features to the Flight Deck to prepare for full OPS. * Liveries - NOTE! 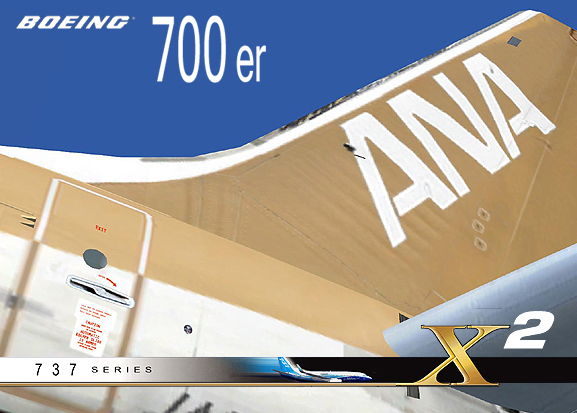 ANA Gold and ANA Blue Schemes and Privatair Schemes and Liveries are available as an option. * Print Enabled Manuals - Installation, Flight Training Guide with Flight Reference Sections and charts and data. * PDF Manuals. Installation, Flight Reference Guide. Flight Training Guide (full color) to take pilots from ramp starts to complete flight routing (The PDF option provides pilots with the ability to use of manuals on second monitors but have been designed especially for use on small displays such as the Apple iPad). 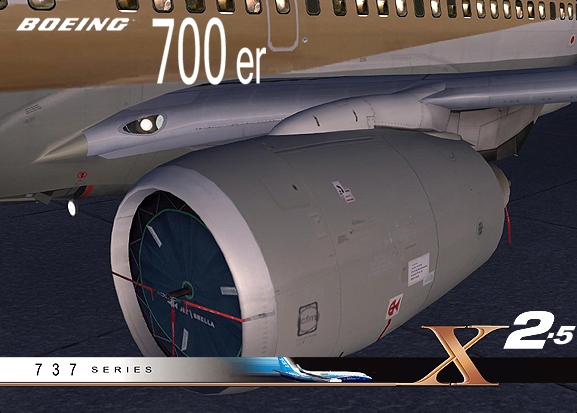 (Limited offers packages are included in this introduction SE pack to offer an introduction to the long-awaited OPS Project and also to give customers an opportunity to purchase the entire 700ER range of products as one package). Software Version X2.5. Scale: 1:1 Comprehensive, Scale-Accurate Aircraft with over 344 enhanced animations & effects and points with fast, frame-rate performance in FSX (sample rate: 12 (low) 34 (mid) 76 (high) fps average (dual and quad-core models). Source: PQ4 Systems). Leading Software Aircraft Design with shape approved by and to Boeing specifications and plans with carefully optimised, poly point management that guarantees better frame rates and with a systems-based, logic engine for ultra-fast calculations and X frame rate [XFPS] performance. advanced HUD and low-viz logic, the new 700ER represents the most advanced 737 yet. Fully-working, radar with forward sweeping PERR Logic provides a working, EGPWS System with variable range, PLN, APP and MAP modes, audio warnings " TERRAIN TERRAIN! PULL UP! " etc. and with CENTER or MAP options. EGPWS is integrated with TCAS and can be used in conjunction wtih HUD. EGPWS comes with active APT, WPR, WPT and other data integrated on-display. Activation on-the-fly with user controlled, on-deck options fro Captain and First Officer at the same time or as separate options with MAP on one and CTR or optional BOTH or switched. The advanced Smith U10.4-based unit now features over 43 pages of comprehensive data with the ability for selectable editing and direct-edit modes with new VNAV Path Descent Logic that actively calculates descent rate data for accurate climb down and approach. Advanced Logical Control of the entire flight deck environment features high-rate, Boeing engineered, technical instrumentation and sytems integration. referencing within the FMCS environment. Featuring end user management and user-adjust logic control. 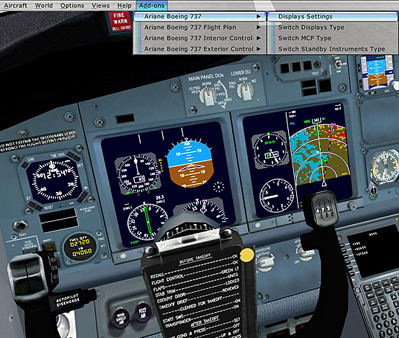 Option to add EFIS to the flight deck and change on-the-fly. MCP SWITCH - Switch over to Collins/Sperry or Rockwell MCP and Standby configurations while flying! Drop down menu combinations. CFM567b Sound recorded both on board, in the flight deck area, galley and outside around the exterior of the Boeing 737 aircraft from different, nexul spatial points from engine front end in blast-safe areas. Sound is produced across the CMI CFM spatial engine variant range using sophisticated, advanced recording equipment and then mixed and edited at high-level, professional, 44hz min. spec. mixed output compressed for smaller footprint and to optimise the best use of the FSX sound engine. The sound was then played in the environments of the real aircraft to check for transparency and realism. (The engine sounds on this model produce an exceptionally realistic and high quality, stereo-processed, full sound - the quality sound of choice for cockpit builders worldwide)! 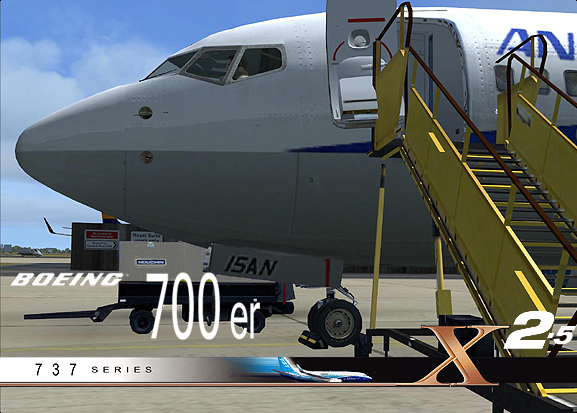 The FSX Boeing 737-700ER represents software developed to a very high standard indeed and has over 1200 logical events and systems than its previous FSX2 cousin. 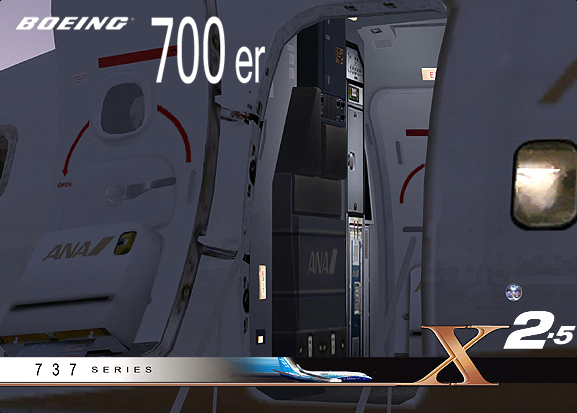 (All our aircraft uniquely achieve the most accurate, 1:1 authentic-scale of a Boeing 737 3d model in the world; but the new Boeing 737-700 ER 'X2' stands out from its predecessors. 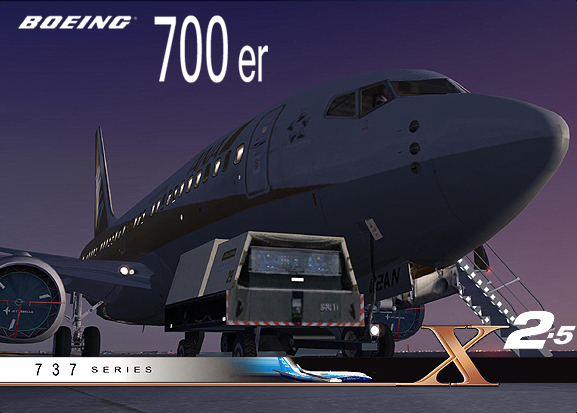 Besides sharing the same instrumentation in line with Boeing's requisite 'commonality' policy the 700ER is world's apart from the rest of the range. Developing a further and more advanced unique logic set developed to stand alone from the main exe of the flight simulator program and not to have to rely on the presence of a command program [FSUIPC] which, although FSUIPC is a great program, developing independantly has made the Ariane Boeing 737-700ER X2 package a more flexible and powerful solution that has once again, raised the bar in simulated flight. With its extended range, fuel and performance management, OPS expandable options, advanced FMCS and features such as EGPWS, HUD, factory-fit EFIS and a complete-coded MCP Logic twinned with the FMCS Function and Operation. It is a powerfully aggressive and more responsive, more adaptable and even more reliable and robust package with an even more accurate envelope than any in its class before it (or yet ahead of it). The Ariane flight FDx (not fde) is one of the most talked-about and revered FD logical configuration set in the simulated world, as used by many cockpit builders around the globe. And to add to its sophisticated and advanced suite of abilities; it comes in two configuration packages. Advanced and OPS. With the added advantage for either desktop or more world-friendly, smaller CO2 footprint, laptop PC use the Boeing 737-700ER package also provides everything required for full-flight routing and mission-critical excercises from great circle routing to planning excercises. 4. Engine Upgrade - CFM567b Series. 5. Airline Upgrade with Fleet Management. 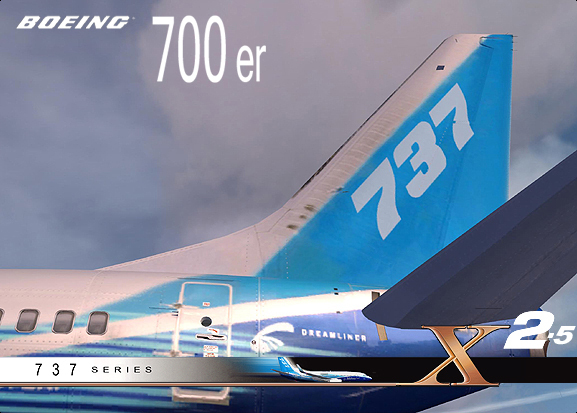 The 737-700ER is the smallest, most swifted member of the Boeing 737 family. 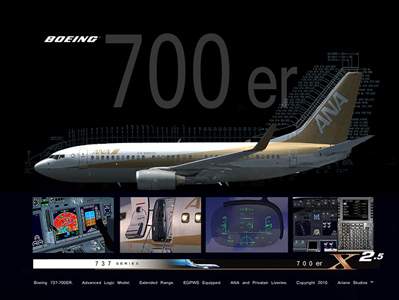 Boeing launched the 737-700ER on January 31, 2006. 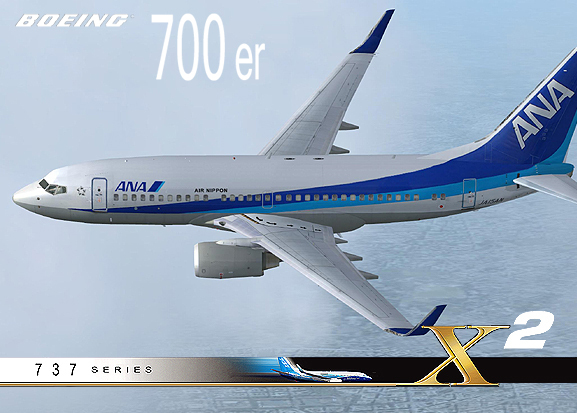 All Nippon Airways was its launch customer with the first of five 737-700ER?s delivered on February 16, 2007. The 737-700ER is a mainline passenger version of the BBJ1 and 737-700 IGW (see 700 package HGW). 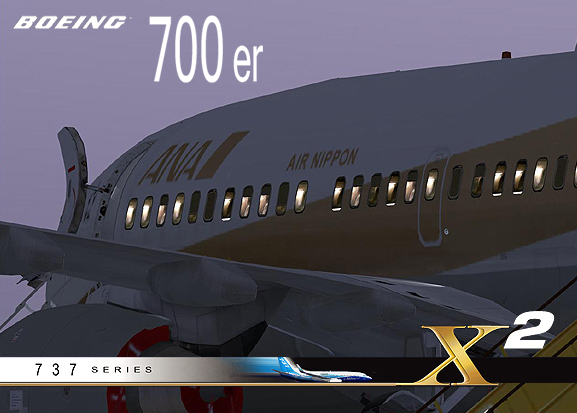 The Boeing 737-700er combines the 737-700 fuselage with the wings and landing gear of the 737-800. The Boeing 737-700ER will offer a range of 5,510 nautical miles (10,205 kilometers) with seating for 126 passengers in a traditional 2-class configuration and the 737-700ER has the second-longest range for a 737 after the BBJ2! 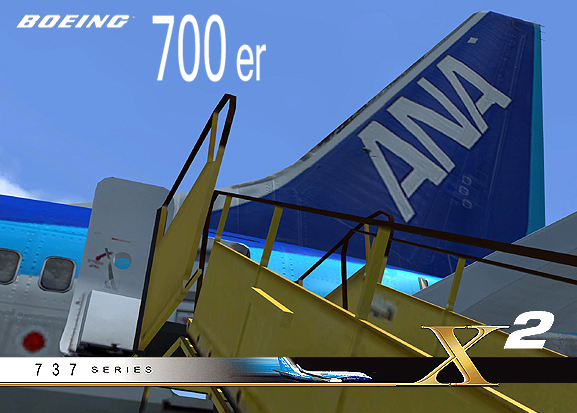 The 737-700ER was designed for long-range commercial applications and was especially confiugured for ANA. All Nippon Airways; Japan's second-biggest carrier, pioneered the model in Asia with a daily service between Tokyo and Mumbai. ANA's service, believed to be the first all-business class route connecting to a developing country, started in September 2007 and used the Boeing 737-700ER outfitted with 38 (38 Club ANA) and 48 (24 Club ANA/24 Economy) in four-across seats configuration and an extra fuel tank. 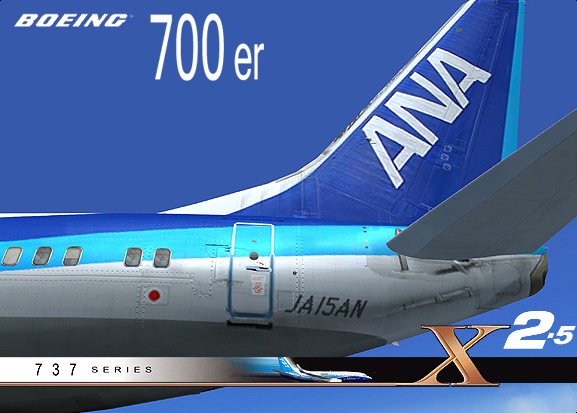 The concept of the aircraft has now been extende with two livery versions. One in ANA Blue and other other in ANA Gold. To add more functionality and range to the Boeing 737-700ER release, Privatair joins the long range jet club with its base of operations in Europe. In addition, the base pack features the BCA livery and the roll out factory option, pre-painted zinc edition. 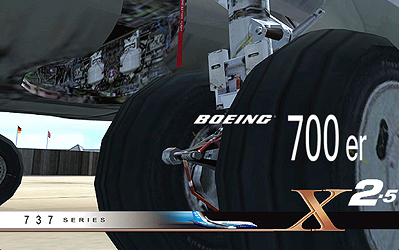 Fully logical and integrated code with fast FPS, hi-compression sound and texture sets and advanced modeling techniques developed solely for FSX. Includes: Bumps. Specs. Shinar. Working, scaled and Boeing-accurate wing movement logic dep. on ground roll movement and weather turbulence divided into sections for optimum movement and effect in FSX. Decal window details show window positions and different window detailing along with bumping and specular light reflections along surface as sun is captured on surfaces. Long Range ER Aircraft, three part FDx with ER capability. High Density of detailed areas on exterior of the aircraft such as ports, doors or antenae; warning labels (so detailed they can be read). Enables crew orientation outside the aircraft making exterior inspections and walk rounds possible. Accurately-scaled static height from ground measured against the Microsoft 1-1 scaling scenery area. Advanced nose section design. Modeled cockpit window frames with opening window viewable from outside of model during walk-round and openable from flight deck. Detailed cockpit interior and Captain and First Officer. Animated gear, doors and bay area. Exit doors operable via menu system. 2 cargo doors and bays operable from menu with Active Loading where OVERLOAD will show if over-loaded on cargo amounts. Animated RAM doors and rear APU port. APU intake vortex generator. Emergency exterior lights. Wheel well lights. Animated ground power connection bay. Animated main outflow valve. Airstair bay with animated door. Animated windshield wipers. 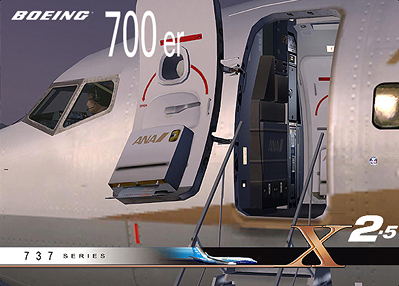 Aircraft configuration meets FSX default payload manager specifications. Textured red beacons and tail strobe devices. Exit doors and interior animations. Glass transparency and glass textures. Dynamic SPec shine with bump mapping showing all raised lines and features on fuselage, vertical stab and engines. etc. Nav lights with illuminating reflections during night and dusk/dawn transition modes with beams from navs in fog and low light etc. Multiple flight deck lighting with dusk/dawn trans effects.Accurately shaped wingroot section. Animated wing contrails with weather dependent definition and rain spray with reverse thrust effect on spray back. Animated under-wing landing lights. 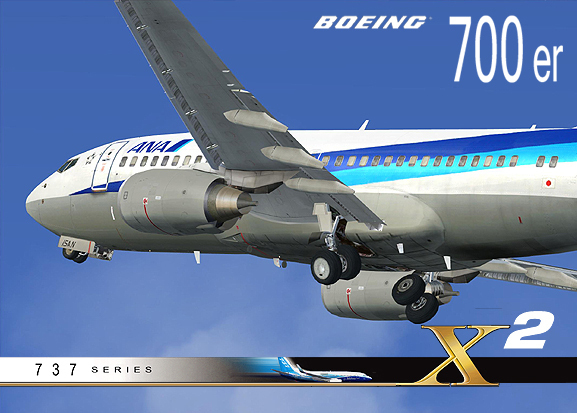 Photorealistic 32 bit texturing illustrated from plans & photographs supplied by Boeing and featuring over 433 layers. Velocity wheels with steering-compressing nose wheel and roll-sensitive main gear that adjusts height to load and is CoG sensitive to angle of load and effect. 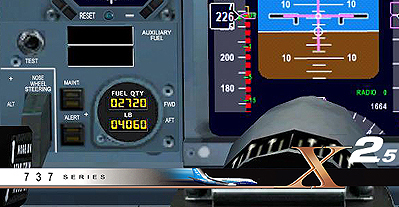 Animated thrust reversers mechanisms with Newton Logic; thrust to-power ratio delay timing. 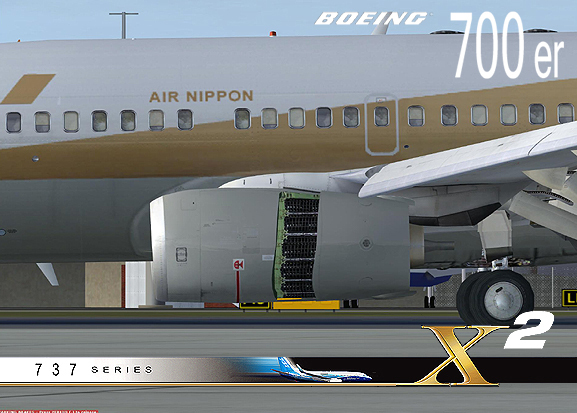 Hi-DEF?, detailed fuselages and enhanced windows. Highly-detailed gear and actuators. Intricately detailed flap pinions and hinges. Modeled lightning and static wick pylons and aerials. Accurately modeled and postioned, UHF, VHF naad HF aerials and antennae. Glass-effect windows reflect ambient light built into graphics support. Front cockpit areas light up with glow of instruments. Lights reflect on faces of Captain and FO at night/dusk/dawn. Editable lighting levels in forward cabin/cockpit. FAST frame rates (uncompressed). Real-time animation brake and roll spoilers. Detailed flap, hinges, pins and screws. HTML electronic check lists and refs. Underwing detail/access ports and inlets. Exit Lights, Logo Lights. Gear-bay Lighting. Twin Landing, Underwing Lights. Taxi Turnoff Lights, Nav, Strobe and Pos Lights. Opening Passenger AFT Door. overwing & PAX reflecting light fx. Accuratly-scaled, multi-stage flap extension and retraction timings. Flight Deck Version X. All common switches clickable and animated and all levers animated (ADvanced/OPS Version features a sound for EVERY clickable switch, button, knob, flip cover, lever, wheel etc. Over 1200 events in the flight deck alone with an advanced logical set for forthcoming use in home cockpits.Special control gauging to enabledisable display range and to adjust FPS in non and used displays. ER Range equipped Flight Deck. NEW 700ER X flight Deck design and layout with HUD. PRI. IMC. VMC modes with RWY and lateral guidance cues. Non-eyebrow window version upper layout. ER Fuel Management Systems. Advanced, Upper Overhead Electronics Panel Area. LOng Range Logic with udpated FMC and INI arrangements. Animated FWD EXIT galley and animated MAIN FWD EXIT doors control panel.Animated windshield wipers with Rain glass wipe effect that shows ?rain removed? on each sweep of wipers when on. 3D magnetic compass, non-gauge modelledcompletely in 3D. compass light switch under base of compass. Display Control System. Master caution System. Standby instrument knobsmodelled in 3D. High Resolution, High Frames Per Second (FPS). Textured main panels with shadows. Active and working Fire Shutdown System with modeled 3d working fire handle. SAVE Seat allows for removal or click-on position of seat for jumo seat viewing. Control column can also be removed from position with one-click removal and replace. Position Logic.Sliding deck widnows and modeled window runners, seals & serial labels on side windows with accurrate, knot limit (84 knots) for window lock. Map clipchart. Click zones EFIS PFD/ND Systems. Clock modelled in 3D, with click zones. Moveable nose steering tiller modelled and controllable in 3D. Packs switches clickable and animated. Night bitmaps with multiple levels of enhanced lighting. New autopilot logics and VC gauging linked to common logic of FDx configuration files. Tooltips activated for every system for fast recognition and prompting. MCP/FMS/IRS Version X. MCP panel and FMC background lighting ambience. Background light for MCP and FMC. Seaprate lighting for flight deck main panels areas and MPC and EFIS. Adjustable displays for sunlight reflection - DIM - BRIGHT. Editable background for CDUs from black to blue with brightness control on main panel above footrest plate. ND & PFD inoperative pre-IRS coordinates entered into FMC System. FMC VNAV profiles. SIDSTAR support. Supplemented HOLD. PROGRESS Logic. Waypoint ALT and SPD restrictions. Smooth curved flight path on vector display pop up ND or EFIS optional displays. MCP and EFIS control panels with high performance. 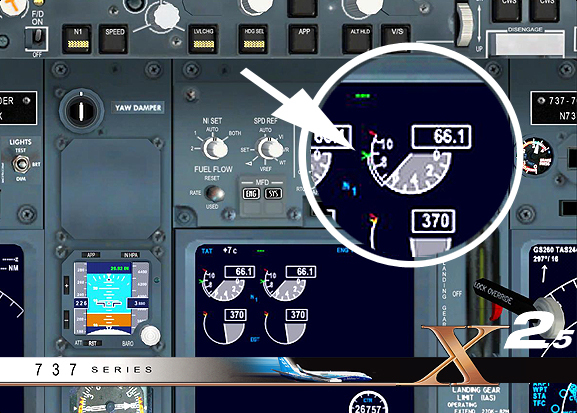 Researched design of EFIS control allows even easier click zones. Increased speed/VNAV holding stability. N1 calculation for TOGA and CLB as per Boeing performance tables. Takeoff N1 table for TOGA added to ini. Actual N1 calculation based on OAT/FMC TAKE OFF page. Climb N1 table added; calculation based on current altitude and CRUISE FL OAT. Take off speeds calculation based on TOW and FLAP POS. 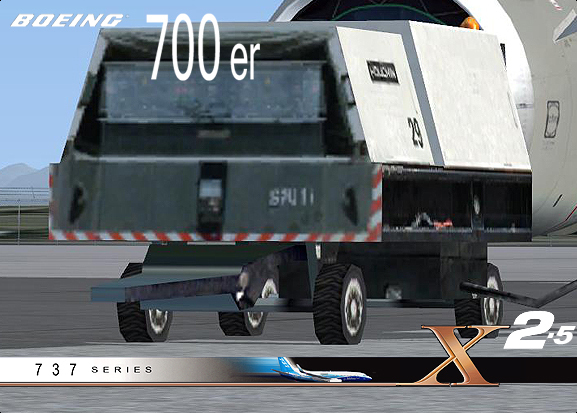 and Boeing Advanced CBT. Boeing 737-700ER X2 Aicraft, FLight Deck and Sound in Green Zinc (awaiting customer) Delivery Scheme and Boeing BCA Livery Roll Out Scheme. Roll out livery with display options as described on product page.